Mr. Painter has been on the vanguard of cyber issues for over twenty years. In his current role as the Secretary’s first Coordinator for Cyber Issues, Mr. Painter coordinates and leads the United States’ diplomatic efforts to advance an open, interoperable, secure and reliable Internet and information infrastructure. He works closely with components across the Department, other agencies, the White House, the private sector and civil society to implement the President’s International Strategy for Cyberspace and ensures that U.S. foreign policy positions on cross-cutting cyber issues are fully synchronized. These issues include promoting norms of responsible state behavior and cyber stability, advancing cybersecurity, fighting cybercrime, promoting multi-stakeholder Internet governance and advancing Internet freedom. Mr. Painter and his team have launched “whole of government” cyber dialogues with numerous countries (including chairing the U.S.-China Cyber Working Group established by Secretary Kerry), designed and carried out regional capacity building initiatives, worked to reduce cyber threats worldwide by combatting operational threats such as Distributed Denial of Service and large-scale cyber intrusions for the purposes of stealing intellectual property and proprietary business information, worked to ensure that fundamental freedoms can be exercised online, and worked diplomatically to build a consensus around our vision of an open, interoperable, secure and reliable cyberspace. His team spearheaded the promotion of transparency and confidence-building measures designed to reduce the risk of miscalculation that could inadvertently lead to conflict in cyberspace—resulting in the negotiation of the first ever bilateral cyber confidence building measures that were announced in June 2013 by President Obama and President Putin, and the agreement to the first set of multi-lateral confidence building measures in the Organization for Security and Cooperation in Europe. Prior to joining the State Department, Mr. Painter served in the White House as Senior Director for Cybersecurity Policy in the National Security Council. During his two years at the White House, Mr. Painter was a senior member of the team that conducted the President’s Cyberspace Policy Review and subsequently served as Acting Cybersecurity Coordinator. 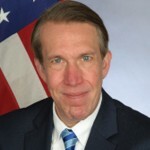 He coordinated the development of the President’s 2011 International Strategy for Cyberspace and chaired high-level interagency groups devoted to international cyber issues. Mr. Painter began his federal career as an Assistant U.S. Attorney in Los Angeles where he led some of the most high profile and significant cybercrime prosecutions in the country, including the prosecution of notorious computer hacker Kevin Mitnick. He subsequently helped lead the case and policy efforts of the Computer Crime and Intellectual Property Section in the U.S. Department of Justice and served, for a short time, as Deputy Assistant Director of the F.B.I.’s Cyber Division. For over fifteen years, Mr. Painter has been a leader in international cyber issues. He has represented the United States in numerous international fora, including chairing the cutting edge G8 High Tech Crime Subgroup from 2002-2012. He has worked with dozens of foreign governments in bilateral meetings and has been a frequent spokesperson and presenter on cyber issues around the globe. Mr. Painter is a graduate of Stanford Law School and Cornell University.